He is the supposed Laughing Man. 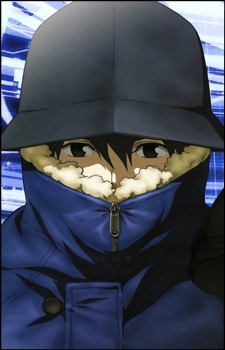 After the events of the Section 9 raid by the Umibozu and the last meeting with Motoko and Aramaki, it was discovered that Aoi, though responsible for the initial incident that made the Laughing Man a phenomenon, was not in fact its true originator. He chose to confront Serano only because of the file he found, and despite years of extensive investigation on his own part, he never discovered the origin of that file. It could be said that whoever abandoned the file was in fact the "real" Laughing Man - and it is possible that he obtained it from someone else. Aoi tells Aramaki to make of that what he will.